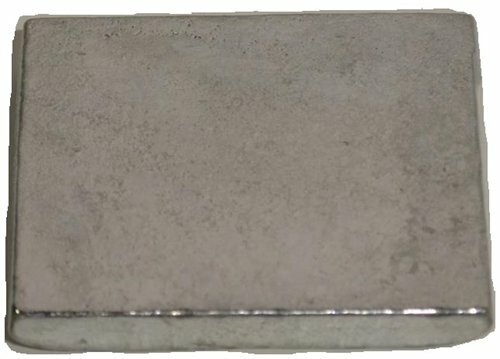 Solid Zinc Sheet - .040" x 8" x 11"
This is a sample piece of .020" thick zinc. 99.6%m min The cut sizes have a tolerance of +/ 1/8". We recommend you order a piece that is larger then you need. Zinc is a bluish-white metal. At room temperature, brittle; 100 ~ 150 ,become softened; exceed 200 , they become brittle. 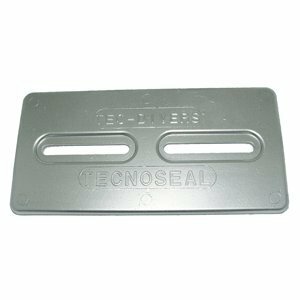 RP-6 - 6" x 1-1/2" Transom Zinc Anode. 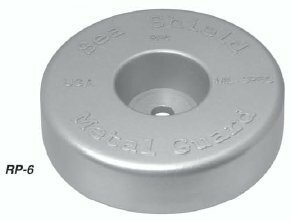 Cranchi/ Azimut Yachts 2" counter bored hole with galvanized steel insert with 1/2" thru-hole is a well suited zinc anode where an 8.6lb zinc is suitable. galvanized steel insert with 1/2 thru-hole. Zinc Sheet - .040" x 8" x 11" cut sides are +/- 1/8". Thickness best for vertical applications such as walls, doors and backsplashes. A direct replacement for lead, zinc provides nonsparking and nonabrasive properties. Over time, a corrosion- and weather-resistant film develops on its surface. Material is often used in stamping, sound deadening, and EMI/RFI shielding applications. Melting temperature is 785 F. Thickness tolerance is 0.005". Due to the nature of product, some scratches and blemishes should be expected. Metal sheets, just like their antique counterparts, may contain a certain amount of flaws, smudges, and scratches especially after shipping. Most of these marks can be buffed out using 0000 Steel Wool once the sheet is installed. This is 99.9% Zinc wire, .125" Diameter. Your order will be sent in 1 foot pieces. Great for Science Projects! AVAILABLE IN 50FT ROLLS and 3 different widths; 3, 6, and 12 for roofs of all shapes and sizes. To achieve optimul results, use the 3 for areas with 20ft or less below the installation area. The 6 protects up to 40ft below installation. For anything over 40ft use the 12. If you are not sure, we recommend the 6, which will provide more zinc exposure and ions to protect the roof. ROOF PROTECTION THAT CAN LAST 20+ YEARS with RotoMetals Zinc Armor. 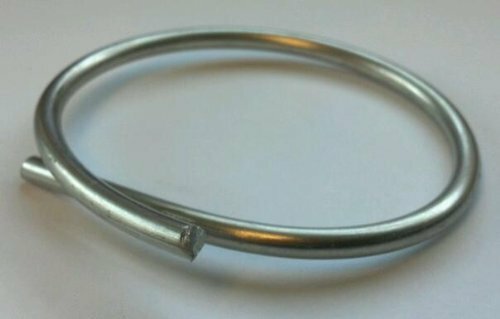 Made with 99.65% Pure Zinc and 0.35% Titanium and Copper (inert) for added strength and durability. 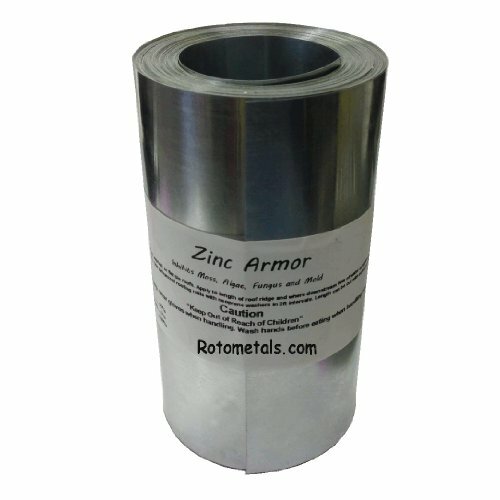 MADE IN THE USA - RotoMetals Zinc Armor is made in the USA. RUST FREE because its made of pure zinc. It's more effective than galvanized steel roof protectants (steel sheets with a thin zinc coating), as that thin zinc coating will chip away eventually and expose the steel which will rust and discolor your roof. Steel rusts, where zinc does not. 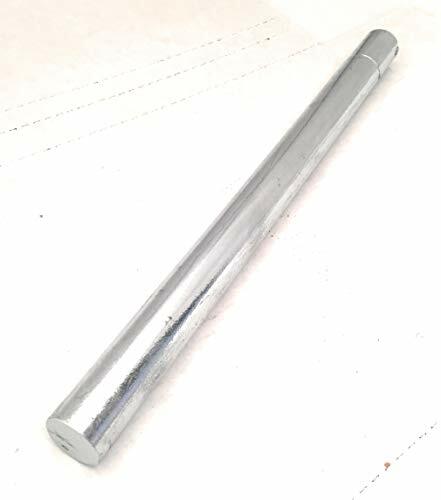 These Zinc Cast Rods are 1" in diameter by 1' long, weigh 2.4 pounds per foot, and have a tolerance of +/- 1/8". As they are cast rods, you may expect chill lines and trapped air pockets. Size: 1" Diameter Length: 12"
Solid Zinc Sheet .008" x 8" x 11"
Zinc Sheet - .008" x 8" x 11" cut sides are +/- 1/8". A direct replacement for lead, zinc provides nonsparking and nonabrasive properties. Over time, a corrosion- and weather-resistant film develops on its surface. Material is often used in stamping, sound deadening, and EMI/RFI shielding applications. Melting temperature is 785 F. Thickness tolerance is 0.005". Due to the nature of product, some scratches and blemishes should be expected. Metal sheets, just like their antique counterparts, may contain a certain amount of flaws, smudges, and scratches especially after shipping. Most of these marks can be buffed out using 0000 Steel Wool once the sheet is installed. 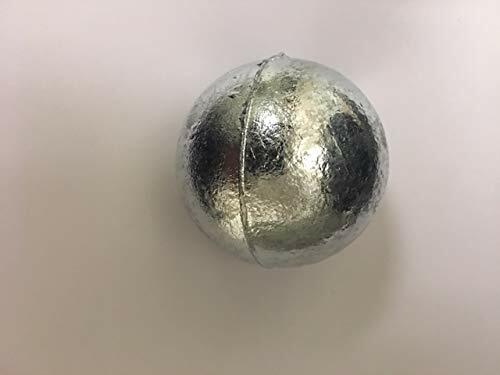 Zinc Ball Anodes - 99.9% Special High-Grade Pure Zinc Balls- 2" Diameter 1 lb. ea. 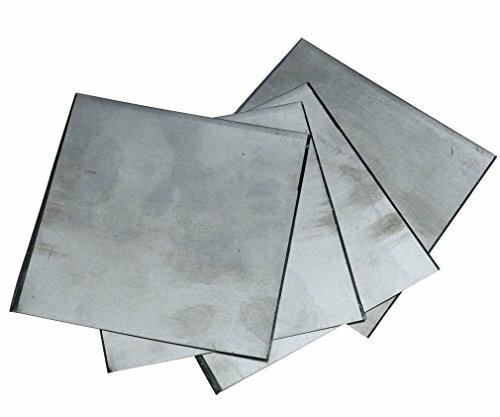 Solid Zinc Sheet - .020" x 8" x 11"
Zinc Sheet - .020" x 8" x 11" cut sides are +/- 1/8". Thickness Best for vertical applications such as walls, doors and backsplashes. A direct replacement for lead, zinc provides nonsparking and nonabrasive properties. Over time, a corrosion- and weather-resistant film develops on its surface. Material is often used in stamping, sound deadening, and EMI/RFI shielding applications. Melting temperature is 785 F. Thickness tolerance is 0.005". Due to the nature of product, some scratches and blemishes should be expected. Metal sheets, just like their antique counterparts, may contain a certain amount of flaws, smudges, and scratches especially after shipping. Most of these marks can be buffed out using 0000 Steel Wool once the sheet is installed. 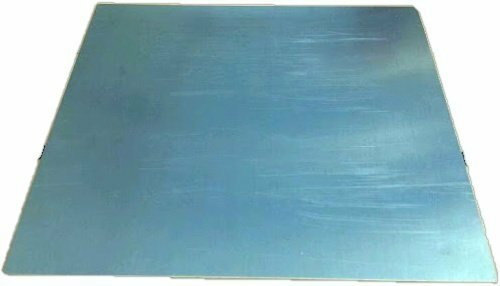 Zinc Sheet - .027" thickness, 36"x 120". Buying a full sheet gives you the best value. The cut sizes have a tolerance of +/ 1/8". These sheets are perfect for those DIYers who want to install their own counter tops, range hoods, back splashes or any other metal projects! Look on our store for sealants and patinas! WARNING: Due to the nature of product, some scratches and blemishes should be expected. Metal sheets, just like their antique counterparts, may contain a certain amount of flaws, smudges, and scratches especially after shipping. Most of these marks can be buffed out using 0000 Steel Wool once the sheet is installed. These sheets will be shipped rolled, once you receive the sheets you can unroll them and lay a board on top to straighten them out overnight. Shipping Warning - By default, these pieces will be rolled into a box and shipped via FedEx. However 5-10% of the time FedEx can damage the edges of the sheets in transit, this is normal and not a reason for return. Most people however don't need the full width, as they will be cutting off some of the edge or folding it under, so shipping via parcel service is fine. WARNING Make sure you unroll and reverse lay the sheet to help it relax and flatten back out faster. You also may apply some heat to help relax it. If you leave the sheet in the shipping box for more then 10-12 days then it becomes harder to flatten. A-20 Zimar Bolt On Undrilled Plate Zinc Anode Length: 3-1/4 in. Width: 2-3/4 in. Thickness: 1/2 in. Weight: 1.1 lbs Model: A-20 The A-20 Zimar Bolt On Undrilled Plate Zinc Anode is hand poured using special high grade 99.995% zinc ignots, which ensures a higher quality zinc anode. Save big on the best A-20 Bolt On Undrilled Plate Zinc Anode available. All Zimar Zinc Anodes are made in the U.S.A, and meet all standards set forth by Mil-Spec A-18001K, Mil-Spec A-18001A, and Mil-Spec A-18001. 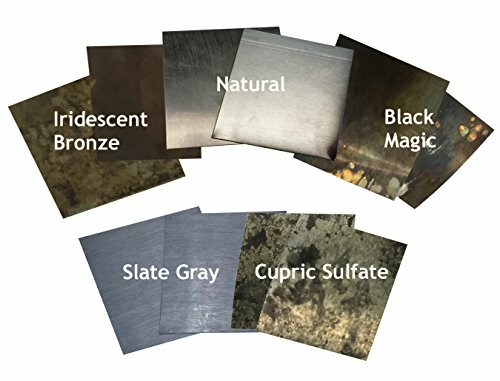 This is a sample pack includes all of our thickness of zinc sheets, plus our Slate Gray, Cupric Sulfate, Black Magic and Iridescent Bronze Patinas. Includes one piece of .020", .027", .027" Soft, .030", .040", and .060" (pieces measure approximately 3" x 3") This is a great way to feel the differences in thickness if you are undecided or if you want to practice bending or soldering. Zinc Sheet - .060" thickness, 8" x 11". Buying a full sheet gives you the best value. The cut sizes have a tolerance of +/ 1/8". 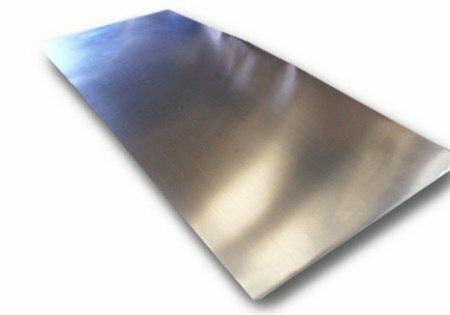 These .060" thick sheets are perfect for those who want to make a change to their counter tops, range hoods, back splashes or any other metal projects! Look on our store for sealants and patinas! WARNING: Due to the nature of product, some scratches and blemishes should be expected. Metal sheets, just like their antique counterparts, may contain a certain amount of flaws, smudges, and scratches especially after shipping. Most of these marks can be buffed out using 0000 Steel Wool once the sheet is installed.